The Jubilee Fellowship Church (JFC) mission team 2017 dedicated Frida Mkiwa’s newly constructed house in Lower Taita. The 42 year old Frida, separated and abandoned by her husband, is a graduate of the Women Equality and Empowerment Program (WEEP) 2016. 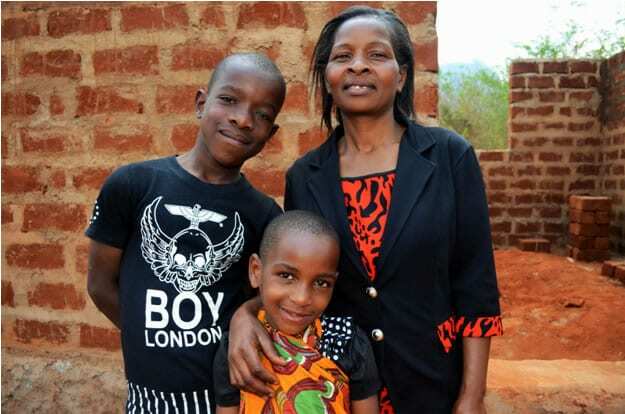 She is a mother of two children; 16 year old Mathias Nyambu and 6 year old Rose Wambugha. The three- roomed house which was constructed by resources raised by the Jubilee team will provide a safe abode for her young family. The day was filed with joy as the team sang praise songs and prayed for the house. The 14 women from the JFC team walked around the house and prayed for protection and provision for the family. They also donated a set of new bedding to Frida’s family. “With the little resources I have, I never imagined that one day I will own a home. I’m so thankful for this gesture of love,” reiterated the ever smiling Frida. Unlike the contemporary African tradition practices in some communities where the separated and abandoned women are neglected, Frida’s mother-in-law was compassionate and gave her the piece of land where the new house was constructed. This is a great relief for Frida who has been renting a house for about three years. “The WEEP women care for each other. They conduct a needs assessment and choose who will be the next beneficiary of the proposed house building project,” echoed Alice Njoroge the WEEP coordinator. Frida has over the years expressed interest in serving the community, majoring on prevention of mother-to-child HIV transmission prevention (PMTCT) since she is one of the beneficiaries. Recently, she was appointed to attend a one week Government- sponsored training known as “Mentor Mothers” focusing on PMTCT. Frida was enrolled to WEEP in 2012 and was trained on good nutrition, antiretroviral drugs adherence, living positively and entrepreneurship. She sews school uniforms, dresses and mosquito nets. Her vision is to become a leading wholesaler of uniforms and dresses in Taita County where she resides with her family.